Yamaha Motor launches new scooter for Vietnam- The Nozza Grande, Featuring a newly-developed, fuel efficient engine loaded onto a stylish body designed for female riders - News Releases | Yamaha Motor Co., Ltd.
IWATA, July 22, 2014 – Yamaha Motor Co., Ltd. (Tokyo:7272) announced today the August launch of the Nozza Grande, a scooter designed with the female rider in mind featuring a newly developed air-cooled 125cc FI*1 engine for the Vietnamese market. The Nozza Grande is a fashionable city scooter with elegant European styling, and equipped with a newly-developed next generation engine with excellent acceleration, fuel economy, and environmental performance. Both the manufacture and sales of the model will be carried out by Yamaha Motor Vietnam Co., Ltd, the Vietnamese branch of the Yamaha Motor Group. The Vietnamese motorcycle market recorded a demand level of approximately 2.8 million units in 2013 (Yamaha Motor survey, 2013), of which, scooters comprised approximately 40%. In 2011, the company developed its first Vietnamese scooter model “for women”, the Nozza, where its stylish design proved very popular and has achieved sales of 110,000 units to date. This second model, the Nozza Grande, has been developed to target the fashion conscious and diversifying young Vietnamese female sector seen in recent times. 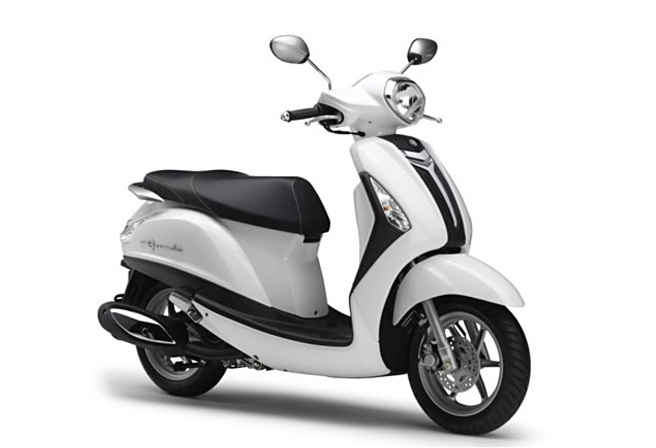 Compared with the company's other scooters intended for ASEAN markets, this model has a larger body and a more elegant riding position. It provides an exterior design with the essence of elegance and luxury in pursuit of the beauty that many women desire in Vietnam, a country where scooters with European styling tend to be popular. Features include: 1) A newly developed engine that is top of its class in both fuel efficiency (54km/L*2) and acceleration, along with lower engine rpm during idle contributing to lower operating noise*3; 2) beautifully draped lines that bring out a graceful body design; and 3) conveniently large (27L) LED lit under seat trunk etc. There are 7 choices of color which help cater for a wide range of rider preferences.